Some days are just a blur. Hopefully no one will hold it against me if I have trouble recounting this one in a meaningful and worthy fashion. We met Anna at 9:00 A.M. in the hotel lobby for a bus tour of Moscow. It was dark, but of course that’s normal for this time of year. The fairyland of lights we’d seen from the 12th floor of the hotel turned out to be Red Square, the Kremlin and a number of busy streets with stores “decked in holiday style”. The Moscow River meanders through the heart of the city, crossed by innumerable bridges. Many of the streets are one-way only, so to reach one going the way you want to go, you end up going blocks out of your way (a bit like San Francisco, only much more complicated) and even crossing bridges once or twice. Our first photo stop was across the river from the Kremlin (more on that in the next post), where blocks of ice floated down the river and created a mosaic of reflections with the fortress. Originally the Kremlin walls were whitewashed, but after the Revolution the whitewash was not renewed, mostly in order for the red color to enhance the message of solidarity. From there we drove in circuitous fashion to the 16th century convent of Novodevichy, encircled by high walls. Founded in 1524 by Tsar Vasily III, it more resembles a fortress than a convent, with 20 towers around its perimeters. Because of the prestigious founder, many high-born women “took the veil” and lived there. It was, however, also used as a prison, some of the more notable prisoners being Peter the Great’s half-sister and first wife. It is also the burial place for many of Russia’s authors, playwrights, poets, actors, political figures and scientists, among whom are Chekhov, Khrushchev, Prokofiev and Shostakovich, to name a few (more than 27,000 are entombed within the walls). As the bus pulled up to the curb, it began to snow heavily, with large flakes drifting lazily down from the leaden sky. Anna asked if we still wanted to get out of the bus to take photos and received a unanimous affirmative. It was enchanting, crossing the snowy park, a true winter wonderland with snowflakes that truly did stay on one’s “nose and eyelashes”. A number of Moscovites walked their dogs, one spaniel clad not only in what resembled green pajamas but little boots as well, a red ball carried in its mouth. Nor was it a bitter cold. We were all reluctant to get back on the bus. One of the many things we saw was a giant ship sculpture with a figure on it that was originally commissioned by a country in South America (I don’t remember which one, sorry) to commemorate Christopher Columbus. When the sculpture was nearly finished, the country changed its mind so the sculptor very cleverly changed the figure to resemble Peter the Great and presented it to Moscow. Our next stop was on the hill in front of the very prestigious Moscow State University, with a view all across the city, and of the 1980 Summer Olympics Complex (which, if you remember your history, the U.S. and 64 other countries boycotted in protest against the Soviet war in Afghanistan). These Olympics were also the first held in any of the eastern bloc of countries. The final stop before lunch was at the Tretyakov Gallery. Pavel Tretyakov came from an ancient but not particularly wealthy line of merchants, and began dabbling in art collection, though without the financial resources to purchase the works of the more popular artists. As his wealth increased, he set down the rule that “money should serve better purposes than just be wasted for everyday needs”, that “living conditions should never allow a person to live idle”. He worked hard during his life and what time he took was with his family, a large and by all accounts loving group. He also worried about what would happen to his collection after his death, fearing that succeeding generations would sell off the art he had so carefully collected, and managed to donate it to the city of Moscow during a time when the city was actually open to such donations. This was another fabulous collection of Russian artists little known to the western world at the time but now even more valuable. On the way back to meet our bus, we crossed the “love locks” bridge (see photo). 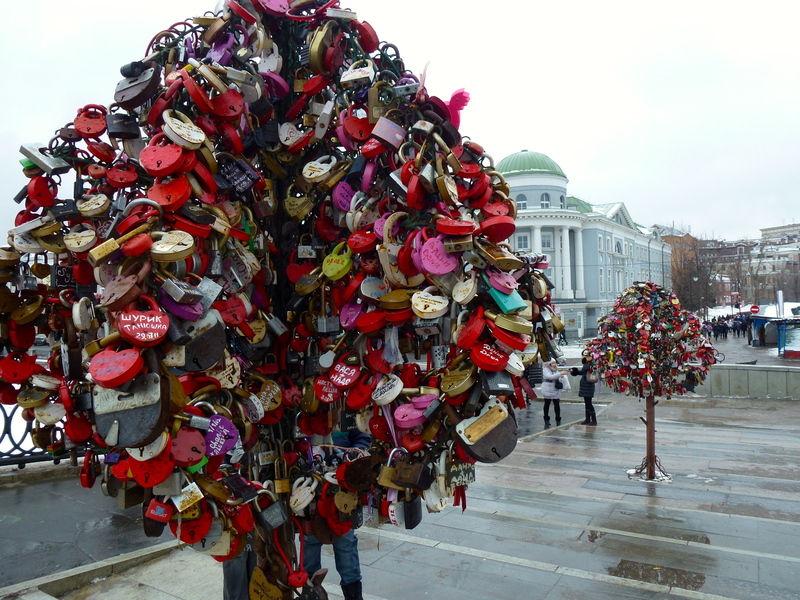 This is a fairly new tradition, wherein a bride and groom will purchase a lock, decorate it, take it to this bridge across the Vodootvodny Canal and attach it to one of the iron “trees” marching across the center. They then have their photo taken whilst throwing the key into the canal. The railings at the sides of the bridge are a stylized, interlocking pattern of wedding rings. As the trees fill up, they are moved to one side of the canal and replaced with empty ones (as a matter of fact when traveling in Paris during the summer of 2011, we came across this lock mystery, which is now explained). One of the locks was almost as large as I! Lunch at the Turandot Restaurant was amazing, not only because of the food (we all agreed that this was the best borscht we had ever eaten), but because of the setting. The site originally belonged to a minor scion of the nobility and did not fare well during the Revolution or World War II. It was eventually purchased and restored at someone’s great personal expense, for the circular interior was a masterpiece of columns and ironwork and gold leaf. We finished our city tour in time to return to the hotel; some of my fellow travelers had secured tickets to “The Nutcracker” at the Bolshoi. Not I, I must confess, the tickets were over $450 U.S.! I opted instead for a quiet evening and a couple of glasses of wine at the bar.